The US-China climate deal announced in December 2014 generated big news. It was yet another diplomatic success for the Obama administration and John Kerry’s State Department. Nothing I say below takes away from that success. In terms of climate action success, the deal ranks pretty low to me. I’ll quickly summarize what I understand of the deal and then share why I think it isn’t a significant climate deal. China, the world’s biggest emitter of greenhouse gases, pledged in the far-reaching agreement to cap its rapidly growing carbon emissions by 2030, or earlier if possible. It also set an ambitious goal of increasing the share of non-fossil fuels to 20 percent of its energy mix by 2030. Obama announced a target to cut U.S. emissions 26 to 28 percent below 2005 levels by 2025 – eight years after he leaves office — the first time the president has set a goal beyond the existing 17 percent target by 2020. The bolded portions highlight the agreement’s big news. China agreed to a carbon emissions cap and the U.S. pushed its emissions reduction target out 5 years and increased the target by ~11% below 2005 levels. China completes a new coal plant every eight to 10 days, and while its economic growth has slowed, it is still expanding at a brisk rate exceeding 7 percent. The scale of construction for China to meet its goals is huge even by Chinese standards. It must add 800 to 1,000 gigawatts of nuclear, wind, solar and other zero-emission generation capacity by 2030 — more than all the coal-fired power plants that exist in China today and close to the total electricity generation capacity in the United States. And to meet its target, the United States will need to double the pace of carbon pollution reduction from 1.2 percent per year on average from 2005 to 2020 to 2.3 to 2.8 percent per year between 2020 and 2025.
Who out there truly believes that China can deploy 800 GW of zero-emission generation capacity in less than 15 years? Remember before you answer in the affirmative that China’s deployment of coal-fired plants exceeded anything in history and that coal remains an extremely cheap energy resource. All the other technologies currently cost more in terms of deployment. What incentives does China, as a developing nation, have to spend more money for intermittent power sources? They’re more interested in growing their economy, as the U.S. is. Speaking of the U.S. – I emphasized part of that quote quite purposefully to highlight the scale of the issue. China must, in 15 years, deploy as much generation infrastructure as exists in the entire U.S. today. Our infrastructure took decades and decades to build out. China needs to do the same thing, with more expensive infrastructure, in 15 short years!? I will be among the first to congratulate China if they accomplish this daunting task and I don’t think China should shy away from working towards it. I just don’t think they have a realistic chance of actually accomplishing it. What about the U.S.? We need to more than double the decarbonization rate of our economy to achieve our emissions goals. Remember that most of the decarbonization achieved since 2005 was due first to the Great Recession and second to the natural gas boom. The Great Recession is finally behind us, though effects linger. The natural gas boom? It’s currently experiencing strong headwinds as OPEC pushes the cost of oil down to the $50 range from the $100-110 range last year. It’s economically unfeasible to frack for natural gas with $50 per barrel of oil. 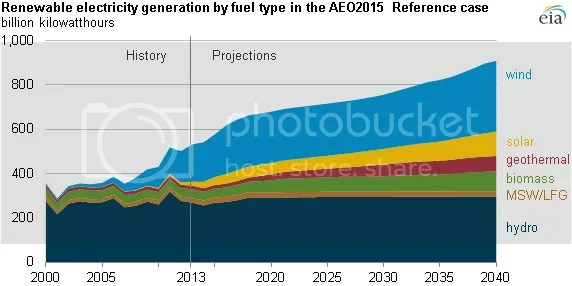 While the natural gas industry won’t collapse (at least I hope it doesn’t), it won’t support additional decarbonization for the foreseeable future either. I believe we are well on our way toward 3-4C warming by 2100 and must plan and act accordingly. This deal, while diplomatically ambitious, is not climate ambitious enough to drive us away from those thresholds. Categories: framing, global warming, policy, politics, science, technology | Tags: $50 oil, climate change policy, climate policy, climate targets, electricity generation, energy policy, global warming, US-China climate agreement | Permalink. The panel intends for this assessment report to guide international negotiators as they work, in the run-up to the big Paris climate summit in December 2015, to hammer out an agreement to reduce global greenhouse gas emissions. The U.N. hopes nations will find a way to squeeze through the ever-shrinking window of opportunity and cut a deal to keep the planet from exceeding 2 degrees Celsius of warming — the goal scientists have set to avoid the worst impacts of climate change — before we blow right past that target. It is worth reminding yourself that everything you encounter in any media is biased somehow. We’re all human and we all have our own biases. Nothing is unbiased or objective because the act of putting words to concepts is derived from brains with preferred neural pathways. There is nothing inherently bad with the bolded language above. It comes from Grist, which many in the climate activist community view as a legitimate source of information (unlike say, Fox News). 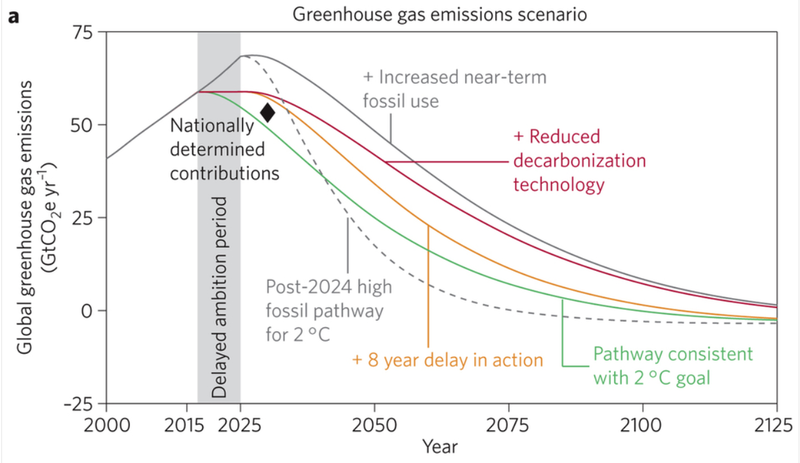 However, the 2 °C threshold was not originally scientific. That was one of the fundamental take home messages of my last post. Negotiators in the early 1990s for the IPCC asked for some type of threshold that they might use in negotiations because, not being scientists, they didn’t know what threshold might be useful or appropriate. A German scientist offered up the 2 °C threshold as part of the UNFCCC process and because nobody else came up with a different threshold or challenged the temperature threshold, negotiators moved it through their process until politicians from countries around the world agreed to insert the language in a formal report. As is usually the case with these type of things, it has remained as the public threshold ever since. Climate scientists started using the threshold as part of their work in an attempt to maintain legitimacy in the funding process because politicians control research purse strings. Finally, as I wrote in my last post, the status quo is very hard to change. Witness the personalized (not science-based!) attacks on the authors of the Nature Comment that initiated the most recent version of the threshold discussion. The language Grist uses plays into skeptics hands. “The goal scientists have set.” That implies that scientists have political power and have already exercised it at the expense of every other person. Unsurprisingly, most people aren’t fans of yielding power without a chance at involvement. Hence one very good reason to subvert those scientists. Grist is helping perpetrate the meme that there is a conspiracy against non-scientists – a meme that many climate scientist activists further inflame when they claim exclusive providence over anything climate related. If activists don’t view someone as a perfect example of their tribe, they attack the “other” without hesitation because they’re using the climate issue as a proxy for arguments they should have instead. Politicians and diplomats set the 2 °C threshold. They were the only ones that had the power to do so. Scientists don’t approve the IPCC’s language. They write their own papers and contribute to the IPCC process, but politicians are responsible for approving every last word in IPCC reports. Grist writers and editors should know this. They’re all too willing to allow zombie myths to keep roaming the discussion space, it appears. Categories: environment, framing, global warming, policy, science | Tags: 2C warming, climate change, climate policy, climate policy negotiations, IPCC, UNFCCC | Permalink.